Presented in conjunction with the exhibition titled "El museo de reproducciones fotograficas," on view inside of the gallery, these hand-painted murals juxtapose two images from the show. 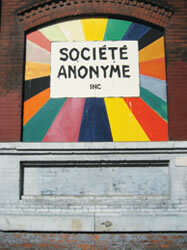 On the left is a detail from a photograph by Margaret Bourke White (1930s); on the right is an approximate reproduction of the sign for the Societe Anonyme -- Katherine Dreier, Marcel Duchamp, and Man Ray's organization for the promotion of so-called avant-garde art in the U.S. (also 1920s/1930s). The two signs represent two fanatical belief systems. 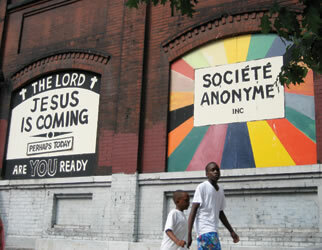 They can be understood in various ways but it is clear that the sign on the left, which reads "Jesus is Coming, Perhaps Today, Are You Ready" references the profound influence of southern Christican black culture in Harlem, while the sign on the right, which simply reads "Societe Anonyme Inc" makes sly reference to Triple Candie's "Anonymous Artist" projects from 2004 and 2005. 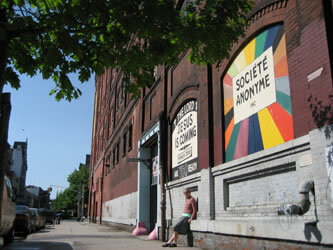 The two signs were painted by Triple Candie; no artists were involved in their creation. They were later destroyed.